I’ve mentioned the trellises and welded boats my husband has made for the garden, and I wanted to send out an invitation to anyone who is interested in seeing some of his work up close and personal. Peter is exhibiting in Rob Glebe’s latest show, along with friend and photographer Sarah Ruckelshaus. The show opens on Friday, August 3 and will be up until August 25. The public (that means all Eastern Shore Gardeners!) is invited to the First Friday Opening reception from 5:00 to 8:00 p.m. 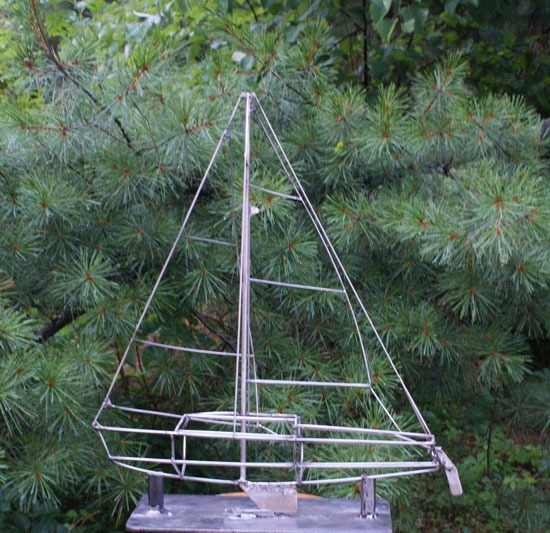 In addition to the pieces in the gallery, the large wire sailboat that has been sailing across my meadow for most of the summer will be on display outside the gallery, sailing through a couple of containers from my garden. I haven’t been able to get a good picture of it, so I hope some of you will stop by to see it in person. It doesn’t fit inside the gallery, so it will come back home after its Friday night appearance. Above: One of the stainless steel welded wire boats by Peter T. Evans. The show and reception will be held at the Artworks/Chestertown RiverArts Gallery located at 306 Park Row, Chestertown, Maryland. Chestertown River Arts is a newly formed organization resulting from the merger of Artworks and the Chestertown Art League.